The Mindful Couples – Bali Couples Retreat is a 5-Day/4-night Couples Retreat in Bali. This all-inclusive couples retreat is the perfect opportunity for you and your partner to slow down, breathe together, and simply be together. 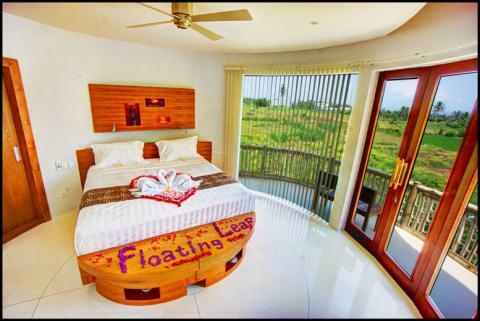 Bali Floating Leaf Eco-Retreat is intimate, luxurious, and comfortable. Plus, it’s a model for sustainability. Every detail have of this romantic hideaway has been thought through and designed to be in harmony with nature. The rooms are beautiful. Each room offers a private terrace with sweeping views, premium bedding, in-room safe, eco-efficient air-conditioning, and an en-suite bathroom. The meals are delicious and healthy. The food is organic and locally grown whenever possible. Don’t worry, there’s free wifi. Hi, I’m Josh. I counsel couples from all over the world. I teach couples simple (and powerful) techniques for connecting and communicating mindfully. I believe that mindfulness and compassion are essential keys to lasting love. 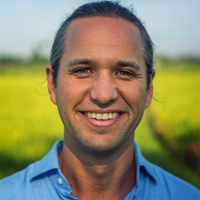 My teachings on mindfulness and relationships have been noted by Mindful Magazine, Elephant Journal, and Mindvalley. I have two master’s degrees—in Psychology and Alternative Education. I’m currently completing my Ph.D. in Psychology, researching the connections between meditation, compassion, and relationships. I love riding my bike, reading stories with my kids, and playing the guitar. Hi, I’m Lindsey. I’ve traveled the world learning the arts of yoga, meditation, music, and healing. I love to teach and share these gifts at retreats, trainings, and workshops around the world. 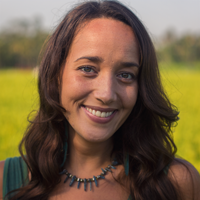 I’ve been a featured at the Bali Spirit Festival, MURFest in Malaysia, and in several yoga teacher trainings. I blend my certifications as a yoga guide, craniosacral therapist, and spiritual healer along with my deep sense of intuition, shining a light on whatever is up for transformation and light in your life. Much of the work I do is helping people find their voice. Being able to clearly express what you need is a key to a healthy relationship. I can help you and your partner remove the barriers to communication, allowing you to open your true voice and expression. I’m a mother of two young children. They keep me young at heart, on my toes, and they teach powerful lessons about love and life. I love traveling and exploring, dancing, singing, swimming, and playing my guitar in the sunshine. We feel blessed to be living happily ever after in Bali. Please note that the costs of the Bali Couples Retreat does not include travel insurance (recommended), airfare, Indonesian visa-on-arrival ($35), Indonesian exit visa ($18), shopping expenses. 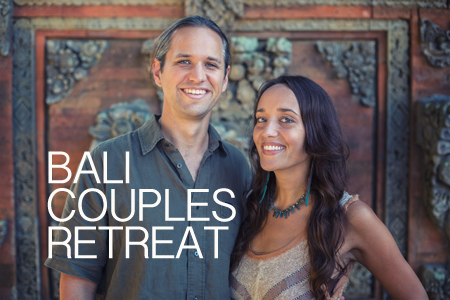 We’re currently offering a discount of $300 off the Mindful Couples 5-Day Bali Couples Retreat. 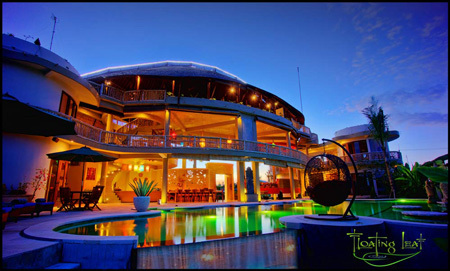 The standard price for this retreat is $2897 per couple. Through the end of February, you can purchase this Bali Couples Retreat for only $2597 per couple. Reserve a space for you and your partner today and you’ll save over 10% of the price on this amazing retreat. It’s the perfect opportunity to make a commitment to improving your relationship. We chose Bali Floating Leaf Eco-Retreat for this couples retreat because it offers the ultimate in luxury, simplicity, and intimacy. This is a small, luxurious setting. It’s away from the hustle and bustle. It’s close to some of the best waves in Bali. It’s a beautiful, intimate sanctuary. Space is limited in this retreat. There is only room for six couples. You can reserve your space today by purchasing this couples retreat package at our discounted rate of $2597. Click below to reserve a room for you and your partner.